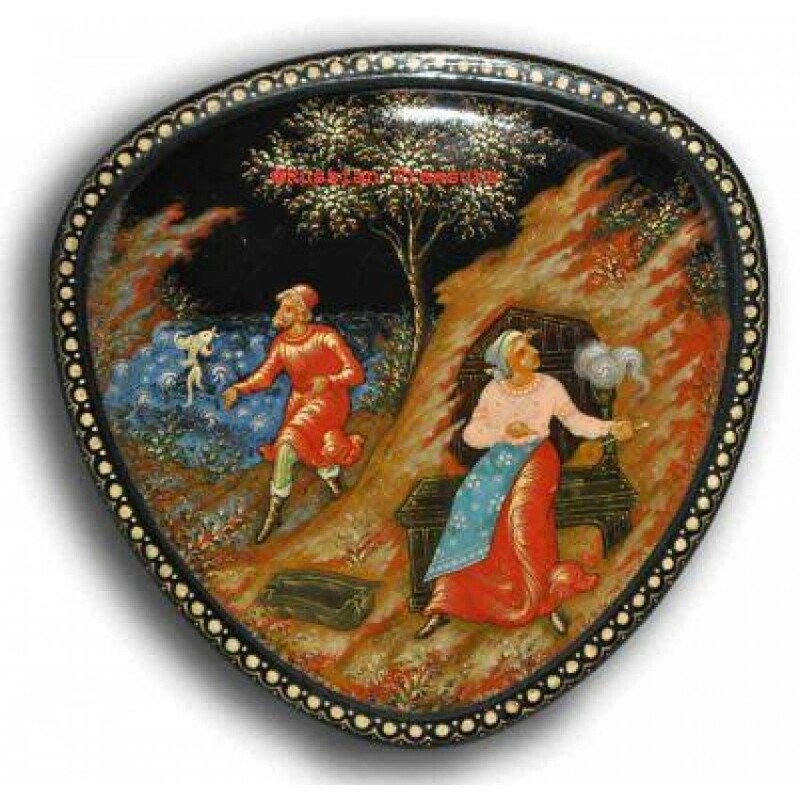 An exquisite piece of Russian artistry, this Palekh lacquer box was hand crafted, painted and polished according to the strict traditional techniques of Russian lacquer miniature painting and is presented to you by Russian Treasure store. The tradition of the Palekh craftsmen to depict different scenes from folk stories, fairy tales and poems is genuinely observed with this lacquer box, as artist Myznikov portrayed the main characters of the moralistic fairy tale “The Fisherman and the Fish”, reworked by the genius of the Russian literature Alexander Pushkin into a poem. The lacquer box features the scene where the poor old Fisherman catches a small golden fish in his net. The fish promises to fulfil all his wishes but the kind man lets her back into the sea without asking for anything. Unlike himself, his wife who was spinning cloth appeared to be rather ambitious. However, her ambitions have led her to the same old mud hut where she and her old fisherman had always lived. 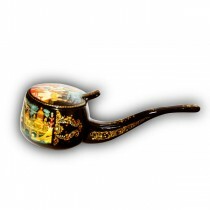 The lacquer box is a perfect example of the masterly paint and lacquer application. The artist managed to express the whole idea of the story with the help of tempera paint: the blue of the deep raging sea, the intensive red and the olive drab of the foreground are enhanced by the ebony background lacquer. The lacquer box is shaped into an accurate triangle with the rounded corners. The lid of the lacquer box is framed with an intricate silver ornament, while the sides are finished with some enticing filigree work. Signed by the artist himself, with the year and place of production carved at the bottom of the lid, this Palekh lacquer box will make a 100% unique gift for the true connoisseurs of Russian artistry or those who simply enjoy beautiful pieces of art.